I think about love every day….how much I love my family, how I love the life I’ve been given, and how much I love the Lord. Love is important to me and with Valentine’s Day just around the corner, I get excited about another chance to express my affection to those around me. It may sound silly and childlike, but I enjoy showing genuine love to others. I think of it as a special delivery directly from God through me. I also feel like loving others helps to define me as a person who loves God and obeys his commands. This year we’d like to help you feel the love and share some too. We’re offering two packages of sweet treats (no calories to guilt over!) to two winners. We want you to feel pampered and cherished and we want you to have the joy of sharing with a friend as well! Speaking of bathing, have you ever wished for a bath to make Cleopatra proud? Use Goat’s Milk Lavender Bath Tea bags to transform your bath into a therapeutic experience that will leave your skin with a healthy glow and lovely lavender scent. Two 2 ounce jars of Mom’s Love Rub, a super-moisturizing ointment. First made to use on boo-boos, Mom’s Love Rub is great for bee stings, bug bites, kitchen burns, dry or chapped skin, and soothing massages. Created with primo oils, herbs, and beeswax, it works great for all types of skin conditions. You’ll receive two of these so you’re able to keep one for yourself and give the other one to someone YOU love. Spread a little love…. 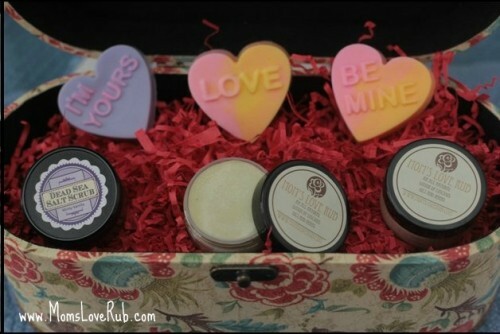 Three fun Minty-Mocha Conversation Heart soaps…..please don’t eat them, though you’ll be tempted to. They’re so cute! Share a smile by your sink with a little love message. To enter the drawings for these two beautiful baskets, simply do the following for a total of 3 entries per person. Be sure and let us know which entries you made. Giveaway period is from Friday, January 27, 2012 until Friday, February 3, 2012. Two winners will be chosen using And the Winner Is by random selection. Winners will be notified on Saturday, February 4, 2012. Winners will have three business days to respond. * Leave a comment on this post sharing a loving Valentine’s Day memory or something you are planning for this year. * Share this giveaway with your family and friends! Choose at least one method: forwarding this email, share on Facebook, share on Twitter. AKA the creator of Mom’s Love Rub and other fine products. Visit her at MomsLoveRub.com. I love this website and visit often. Thank you. I shared the link to Mentoring Moments (this particular post) on FB and visited her site, in addition to commenting here. I would love being the recipient of this giveaway. I am always looking for products that will keep my skin hydrated for longer than 5 minutes. Thank you all. Wow! What an exciting site. Thanks to my facebook friend who posted it and so I can now experience a great feeling everyday. The great package give away sounds awesome. I am planning this year to have less of self and give more to others. I visited her site and shared Mentoring Moments with an e-mail. Thanks for sharing. I believe God wired women to be nurturing. Those of us who have the Holy Spirit are taped in the greatest love source and if we let it flow it will just spill out on others. In our home with the limited budget occasions like Valentine’s Day must be simple. But you know I believe that can make it all the more special. We must give it some thought rather than taking the easy way out of going out for supper or ordering flowers. It’s much more personal. I plan on making silly heart shaped pancakes for breakfast then making one of my hubby’s favorite suppers. I am also sorting out in my mind a letter I’m going to write to him letting him know how much I appreciate him, respect him, and am thankful for the way that he loves the Lord and loves me. I visited the website. The fizzy foot soak looks nice and like it might be fun. I shared this on FB so others can get in on the fun! I shared this on Facebook so others can get in on the fun! 1.I checked out their website and I was pleasantly surprised at their low prices 🙂 I checked out mom’s love rub on fb and liked them. 2. I also shared this on my FB page (http://mentoringmoments.org/moms-love-rub/). I want you to know how much I enjoy Mentoring Moments. I look forward to opening my email when I see it in my inbox. I usually make something in shape of a heart: muffins, dessert cake,cookies etc. I would love to win, please include me. I checked out her website. Fun stuff! Ok – it is official! I think I am a registered contestant!! 1- I have checked out the website!! Yummy! 3- An official Valentine memory? Hmmmmmm, probably homemade peanut butter balls – and a laid back day with no schedule..mmmmmmmm…delicious! Love you guys – I’ve been wanting some Love Rub for a while now! We think Valentine’s day love should be a reflection of the love we show each other every other day of the year, so we don’t necessarily “save up” our affection for that day. But my husband like to get me flowers and chocolate covered strawberries, and I like to make him a favorite meal. Valentine’s Day…yeah! I think my husband will be in town, but I’m not sure. If he is, I think I’ll make him a nice dinner. We like to go out, but V-Day is one holiday that finds me at home, because I don’t like crowded restaurants. He is a chocoholic, so I think I’ll find a special, decadent dessert to make for him! 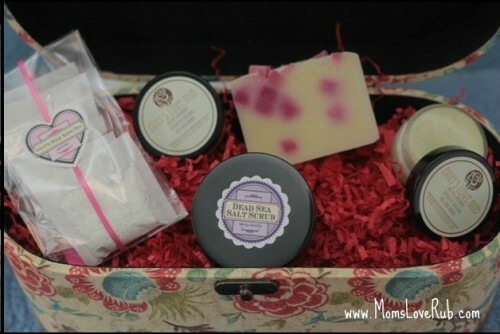 Thanks for the giveaway- I’d love some Mom’s Love Rub and other goodies. My husband and I after 27 years of marriage that we are going back to the important things of life not all the fluffn’stuff. We have to beautiful daughters a son-in-law, one precious grandson and a darling new grandchild on the way….what could be better than that? We don’t have new cars, a fine expensive home, or credit card debt. We have all we need in Christ and love. Thank you for your beautiful words of encourgement. The best gift my husband ever gave me was 21 years ago on Valentine’s Day he underwent surgery to reverse a vasectomy which eventually resulted in 2 wonderful children. Hmm, my favorite Valentine’s Day… well, it probably was the first Valentine’s Day that Clayton and I spent together. Him and his brother put together a surprise evening for my bff and I. It was so fun! shared on FB and tweeted 🙂 I of course also visited your web page! Thank you for this opportunity! If I were to win one of the baskets, I would give it to my mom. We lost my Daddy unexpectedly on her birthday in December 2011 and it has been a very difficult two months. She is dreading Valentine’s Day because they always went out to dinner and she’s missing him terribly. If I win the basket, I’ll give it to her as a gift from Daddy. Thank you for a sweet offer. Love your website! I’ll be thinking back to 20 years ago when we were 5 minutes last for our rehearsal. I was late finishing up the flowers in the church and rushed back to shower and change. It was a fun night, but the day after was even better when I actually walked down the aisle to my wonderful guy and became his wife. I just got asked to help with my kiddos’ classes at school…. so I’m thinking of creative ways to box up valentines and tie it in with the curriculum. And then it will be a great family meal together, because we all are blessed to be together. Jan has quite the talent and creativity! I’m blessed to call her my cousin as well. Her products are one-of-a-kind and fantastic! Her strawberries and champagne bar of soap is one of my favorites. I’ve given away several bars of her different soaps as gifts to my friends and they were a huge hit! I’ve also used her website and posted her link to my FB page.